Have you ever wondered what the weather is like in Myrtle Beach throughout the year? Though most guests are familiar with the gorgeous (and hot) summer days, fewer are familiar with the agreeable spring and fall weather and the surprisingly mild winters that the beach actually offers. Being more familiar with the seasons could help you figure out when the best time of the year is to visit (and could help you save money during an off season getaway). Though Myrtle Beach winters are rather mild compared to more northern states, things really start to perk up around March when spring rolls around. The temperatures are quite agreeable, with daily averages in the 60’s-70’s and the forecast typically includes a mix of sunny days and some spring showers. Spring is a popular time of year for spring break vacations, Easter weekend getaways, and our St Patrick’s Day celebrations. Additionally, many Myrtle Beach attractions that close for the winter re-open their doors to greet springtime guests. Most beach visitors are familiar with Myrtle Beach summers. Abundant sunshine, warm temperatures, and the occasional beach thunderstorm are the top three things you can expect during your summer vacation. Temperatures are typically in the high 80’s – low 90’s during the day and mid-70’s during the evening hours, making it easy to soak up the sun during the day and hit the town at night. Be sure to pack plenty of sunscreen and beach toys if you are heading to our coastline during the summer! Summer is the most popular time of year for beach vacations. Guests come to take advantage of summer breaks and to enjoy our many local events, succulent beach dining, and family friendly attractions. Popular summer events include the Hot Summer Nights series, hosted by the Myrtle Beach Boardwalk, Myrtle Beach Pelicans Games (our local minor league baseball team), and various family activities and fireworks at Broadway at the Beach. 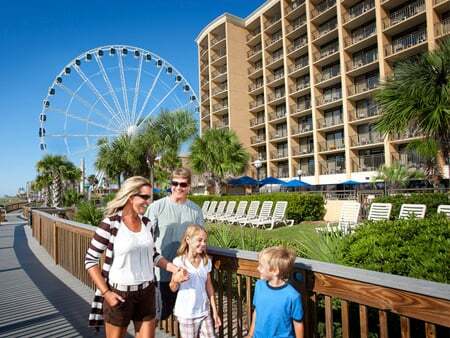 The fall season in Myrtle Beach is often considered the most underrated time of year to visit. The weather is fantastic with temperatures typically staying within the 70’s and 80’s and far fewer rain showers than any other time of the year. Hotel prices are typically lower, the weather is still perfect for hitting the beach, and there are tons of local events and festivals to enjoy. The fall is a popular time for Labor Day weekend getaways or for extended Thanksgiving vacations. Visitors often enjoy the empty beaches, the plethora of fun local festivals, and enjoying outdoor dining and entertainment at local restaurants. The beach begins to cool off at the end of the fall season and temperatures can get quite chilly! Most days stay above freezing, though we have gotten as low as the single digits before. Still, temperatures in the 30’s and 40’s are what you can expect if you are in the area during the holiday months. Hotel prices are quite reasonable during this season and many “snowbird” guests get great deals on condos while they escape the brutal snow-season up north. Winter vacationers are typically in town for a snowbird vacation or are enjoying a holiday getaway. Winter beach visitors like to take advantage of Myrtle Beach's indoor attractions and lively holiday related entertainment and events. Well, there you have it! Everything you need to know about Myrtle Beach weather to help you plan the perfect beach vacation. We want to know – when is your favorite time to visit Myrtle Beach? Fall is quickly approaching and now is the time to start planning your off-season vacation to Myrtle Beach! While a beach vacation might not sounds appealing at first, we promise that Myrtle Beach still has plenty of perks outside of the prime summer season. The fall and spring seasons offer pristine beach weather and empty beaches compared to the busy summer season. The temperatures remain enjoyable from April – October, a little known fact for our visitors. Guests still have plenty of time to avoid the crowds and take advantage of the sun and sand. And, even when the water does get too chilly to jump in, the beach is always a great place to watch the sun rise, take a scenic evening stroll, or enjoy a leisurely min-day picnic. The off-season also tends to be more lenient when it comes to having pets on the beach, so pet lovers often enjoy the shoulder season where they can bring their favorite furry friend along for the adventure. Planning a summer vacation in Myrtle Beach can quickly escalate into a costly affair. Taking an slightly earlier or later vacation, however, can save big bucks all around. Prices in the off-season can be quite reasonable and can even enable you to enjoy a much longer stay for the same budget you’d spend in the summer. Fall, in particular, is a popular time for guests as the weather stays beach-worth through the end of October and visitors can enjoy all of the other perks of their off-season trip. Myrtle Beach is also a great destination for a holiday getaway for Thanksgiving, Christmas, New Years, or even Easter. The area offers plenty of lively events and entertainment during the holiday season, so guests will still find plenty to do year round. Tip: Be sure to check our Early Book program to save even more on your beach getaway! Many visitors come to Myrtle Beach to enjoy the beach, of course, but did you know that there are tons of other exciting local attractions and events that you can take advantage of during your visit? And yes – many of our local activities are open throughout the year, making it easy to find plenty to fill your itinerary no matter what time of the year you decide to come. Be sure to check with the front desk for recommendations and check out our full list of Myrtle Beach attractions for details. Though the summer offers plenty of exciting area events, Myrtle Beach offers a full slew of local events throughout the entire year. Spring and fall offer perfect weather for hitting the town and enjoying outdoor activities while the holidays offer tons of themed outings to enjoy with family and friends. Top Fall Events include the Carolina Roots Reggae Festival, Oktoberfest, Taste of the Town, Coastal Uncorked, Murrells Inlet Oyster Roast, Irish Italian Festival, and Brew at the Zoo – to name a few. Food festivals are the highlight of the fall and every weekend from Labor Day to Halloween is packed with tasty things to do. The holidays offer everything from spooky Halloween themed outings, lush Thanksgiving dinners, and colorful Christmas themed live entertainment. Legends in Concert, Palace Theatre, Carolina Opry, and Alabama Theater all offer spectacular Christmas shows and many local area restaurants offer decadent holiday feasts. Spring brings lots of green with the St. Patrick’s Day festivals and parades in addition to the beginning of baseball season for the Myrtle Beach Pelicans and tasty Cinco De Mayo and Memorial Day weekend events across the area. Have we convinced you yet? An off-season vacation is the perfect option for the budget-savvy traveler, for anyone looking for a fun holiday travel destination, or for anyone who loves the beach but hates the crowds. Start planning your off-season Myrtle Beach getaway today!